The new car and passenger ferry will have a capacity of around 800 passengers and will be designed with the environment and icy winter conditions in mind. Finnish shipyard Rauma Marine Constructions and Kvarken Link have signed a construction agreement for a new ferry connecting the Finnish city of Vaasa with Umeå in Sweden. 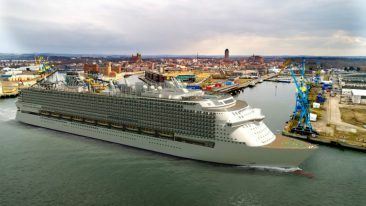 The car and passenger ferry order is worth approximately 120 million euros and was placed by Kvarken Link, which is jointly owned by the cities of Vaasa and Umeå. The ferry will be completed in 2021 and will accommodate approximately 800 passengers, with a freight capacity of 1 500 lane metres for lorries. The ferry will be designed to be environmentally friendly and built to the standards of ice-class 1A Super to be able to navigate the challenging winter conditions in the Kvarken region. 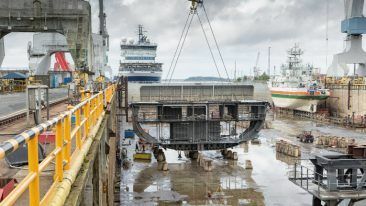 In the autumn of 2018, Rauma Marine Constructions also signed letters of intent for a new 250 million-euro ferry for Tallink and for four combat vessels for the Ministry of Defence, which has resulted in the shipyard increasing its workforce.